Curtain ring set includes 50 rings with eyelets and removable clips. The rings are solid and the clips even more so. Fits Up To 3/4 Inch Rod. The move well and the clips are strong and hold your heavy curtains. 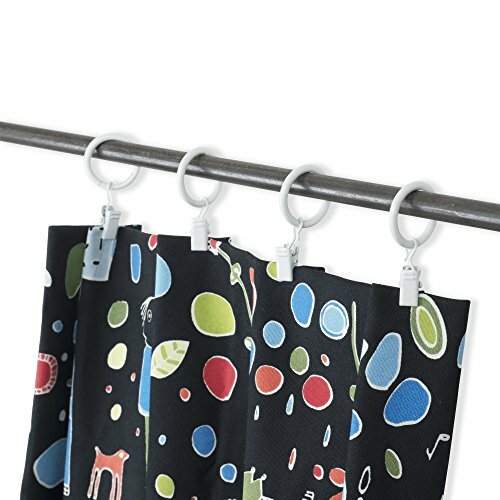 It can be used 9 rings for a single 51 inch curtain. With stylish electroplated white finish fits in any window decor. You can hang your curtains with either combination - rings with clips or rings with hooks. Curtains hang well and have enough fabric in-between rings to drape nicely. If you have any questions about this product by KAO Mart, contact us by completing and submitting the form below. If you are looking for a specif part number, please include it with your message.